Home second Test versus South Africa Sri Lanka: seamers keep second Test versus South Africa. Sri Lanka: seamers keep second Test versus South Africa. 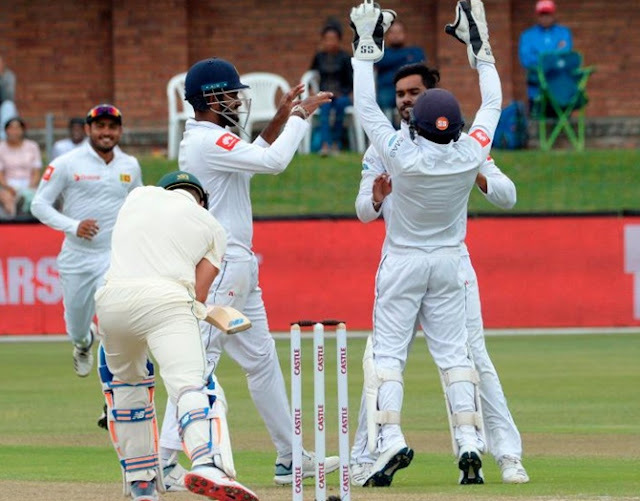 Sri Lanka seamer Kasun Rajitha grabbed two wickets as South Africa limped to 91 for five at tea on day two of the second and final Test at St George’s Park on Friday as the game continues to move forward at pace. The home side have an overall lead of 159, but suffered a massive blow when they lost in-form Quinton de Kock on the last ball before the interval, caught and bowled by Suranga Lakmal. Captain Faf du Plessis will resume after the break with debutant all-rounder Wiaan Mulder, seeking to push the South African lead past 200. The home side’s top-order struggles have continued as opener Dean Elgar’s wretched form meant he was out for two on the last ball before lunch to seamer Vishwa Fernando. Aiden Markram (18) had looked in good touch before he turned a Rajitha (2-20) delivery to Oshada Fernando at a short mid-wicket and Temba Bavuma (6) edged the same bowler to wicketkeeper Niroshan Dickwella. Hashim Amla (32) was out 10 minutes before the interval when he edged part-time spinner Dhananjaya de Silva to slip, and the wicket of De Kock made it Sri Lanka’s session. The bowlers have done superbly to restrict the home side, especially as they are without frontline slow bowler Lasith Embuldeniya, who broke his thumb attempting a caught and bowled in South Africa’s first innings and is out of the Test. The home side made light work of the lower order, though Dickwella (42) mounted a spirited fightback before he was the last man out, a fine running catch from Elgar off Rabada, who finished with four for 38.